Have you ever thought of yourself as a "regular" in a cafe or diner? Are you a little bit like Norm from Cheers? This is something entirely familiar to me, since I waited table at Lottie's Restaurant in York Village, Maine. I was the same folks every day, heard them laughing and bickering over one of Lottie's homemade pies or a BLT. I knew exactly when certain men would show up, sit together at a booth or a back table.I heard them discuss what was happening in town, in the world. Their candor was refreshing and insightful. I probably heard more than a 15 year old girl needed to hear. But what has lingered is not the topics. It is the idea that everyone has a someplace. 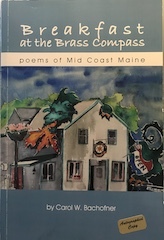 The someplace of this collection is a small cafe in downtown Rockland, Maine. I spent countless mornings there, gathering in the flavors and conversations of this little seaside city and its people, many of whom fit the regulars description. A huge part of any hometown eatery is the serving staff. The girls at the Brass Compass and their customers made my work as a poet easy. As a chronicler of flavor (food and otherwise) I had a nearly limitless menu of ideas and incidents. The book takes readers on a morning pilgrimage to this little city's inner personality. Grab a cup of coffee and order something. Settle in with these poems. Carol Willette Bachofner's poems are sacred poetry that exults in the senses. Fine-etched, delicate diction combines with passionate natural imagery to offer us lovely work that, poem after poem, affirms life, whether the subject is an Andrew Wyeth painting, love, sleep, the body of a bird, a shadow, a statue of Edna St Vincent Millay, or a tavern menu with all its luscious detail. bacon crisp as a fall afternoon. eggs benedict, or Matinicus with crab cake. butter floating on the surface like sunshine. you have to go when your meal is done. Wipe your chin.